One of the themes of this blog has been the increasing importance of global commodity markets in driving pricing and value in European power and gas markets. The influence of Brent crude and LNG on European gas hub pricing has been one important factor. The re-emergence of coal as a dominant price setting fuel in Continental European power markets has been another. But these factors sit against a backdrop of a pronounced tightening in cross asset class correlations since the onset of the financial crisis. The rise in correlations between global currency, equity, bond and commodity markets has been driven by an increasing dependence of the global economy and capital flows on government and central bank intervention. With new measures announced over the last three months, central banks in the US, Europe and Japan have stepped up this unprecedented intervention. But the evidence is mounting that they are losing the battle against a deleveraging global economy. The diminishing impact of intervention on global growth is clearly illustrated in Chart 1. The slowdown in global growth has been weighing on global commodity prices as illustrated by the Reuters CRB global commodity price index in Chart 2 (black continuous line). 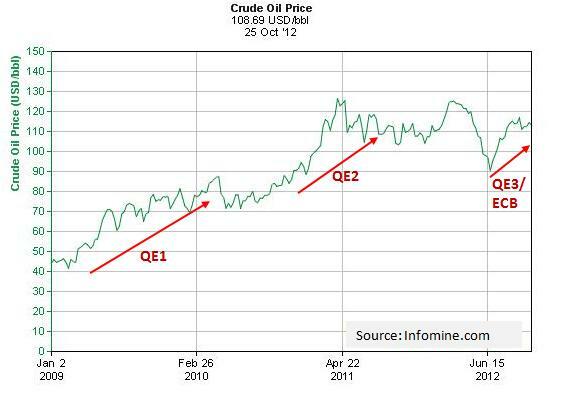 Commodity prices peaked in early 2011 (around the time of QE2) and have been in a downtrend since. There was a sharp bounce in prices over the summer of this year, but since QE3 was announced prices have resumed their decline. It is also interesting to note the divergence between equity and commodity markets over 2012. Monetary easing may be supporting share prices as investors search for returns in a low interest rate environment. But as we set out last month, the key driver of commodity markets is global economic growth. The CRB index in Chart 2 focuses on the price of a basket of global commodities and as such can disguise a divergence in the price of individual commodities. A key divergence has emerged in 2012 between crude oil, gas and coal prices. A sharp fall in coal prices due to a slowing Chinese economy has boosted margins on coal fired generators with plant load factors increasing accordingly. While Brent crude and natural gas prices have been more robust, compressing gas plant margins and load factors. Chart 3 focuses in on front month Brent crude oil prices. The story of diminishing returns from monetary intervention is clear here as it is in Chart 1, although not as pronounced given a tight production environment and geo-political risks. The long end of the Brent curve has remained anchored in a fairly tight range around $90/bbl. While the anticipation and announcement of intervention from the Fed and ECB have driven a sharp rally in crude prices over the summer, that rally appears to be stalling over the last few weeks. A key question for European energy markets in 2013 is whether oil and gas prices will fall to re-converge with coal as the global economy slows. A lack of follow through from the latest round of intervention suggests that this is increasingly likely.